Annie never walked, she never spoke, and she never worked. She filled our lives with smiles, and radiated light and love every day of her life. Christine is a fellow blogger who recently published a memoir of life with her sister, Annie. Annie was born severely brain damaged and lived 51 years, dying from cancer. Her memoir, Dancing in Heaven, recounts the importance of Annie in their daily lives. While Annie couldn’t talk or write, she communicated with them nonetheless. Annie looked forward to time with her father, the antics of her siblings, and the love of her mother. Christine tells one childhood story where she and her older sister, Carol, came running in the house to tell their mother about finding a baby bird. Annie started laughing, spitting food all over their mother. In another story, her father sat in the sand at the beach, with Annie between his legs so she could feel the surf as it rolled in. Christine also shared a picture of this, and Annie loved it. Annie’s parents kept her home for her entire life. Her father build her special chairs to sit in, so that her head didn’t roll to the side. They took her everywhere with them, from vacations to visiting family. They tried school for a while, but the school system would not work with Annie’s needs and they finally withdrew her. Christine writes in detail about Annie’s last days, of the frustrations of getting her diagnosed, then working with hospice so Annie could die at home. For anyone who is coping with a dying family member (or friend), Christine gives good insight into what happens and the need to be vigilant in obtaining care. Christine is candid about her childhood disappointments in Annie’s needs being met before hers, realizing as an adult that if she had been the one with brain damage instead of Annie, they would have taken care of her the same way. I would encourage you to visit Christine’s blog, Random Thoughts From Midlife. Christine is currently documenting coping with her father’s worsening Alzheimer’s. She also shared her path to self-publishing, which is of great interest to anyone thinking of publishing in this way. Christine’s love for her sister will never expire. Her memoir is a lovely tribute to the life of this dear family member. 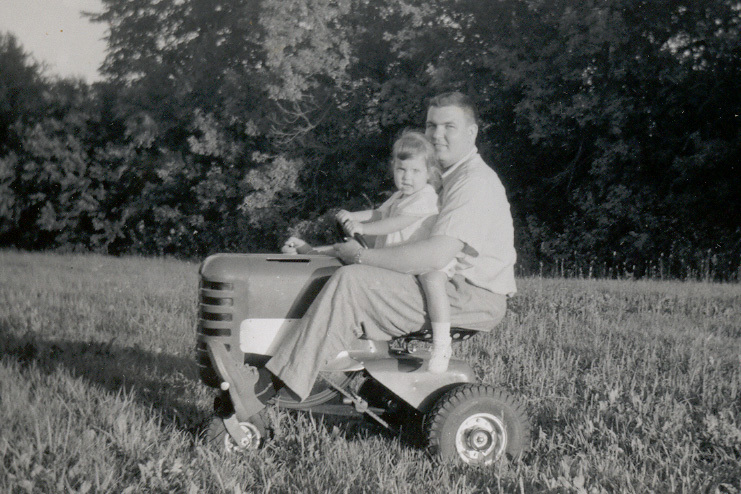 My picture today is me with my father, riding around on the miniature tractor owned by his younger brother. Look at those big smiles! Word for tomorrow – WELCOMING. If you prefer to work ahead, see the list for the week under “A Word A Day”. ← Boy Picture – New! Thanks for the lovely review. I think I’ll put a permanent link to it on my Dancing in Heaven page. You’ve been kind. Thank you for sharing Christine and Annie’s story. It gave a healthy perspective to my daily life with Jaimie. Actually, I think you face many of the same issues with Jaimie. She’s more mobile, but that brings its own set of issues as well. I can’t get over how big she is and so pretty too.